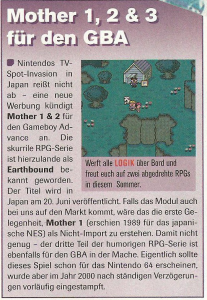 It also claims that Mother3 will soon be coming out. I hope you haven’t gotten any messages about that yet. Nintendo’s TV commercial invasion in Japan isn’t leaving – a new commercial announced Mother 1 & 2 for the Game Boy Advance. The scurrilous RPG series is known as EarthBound in this country. The title will be released in Japan on June 20. 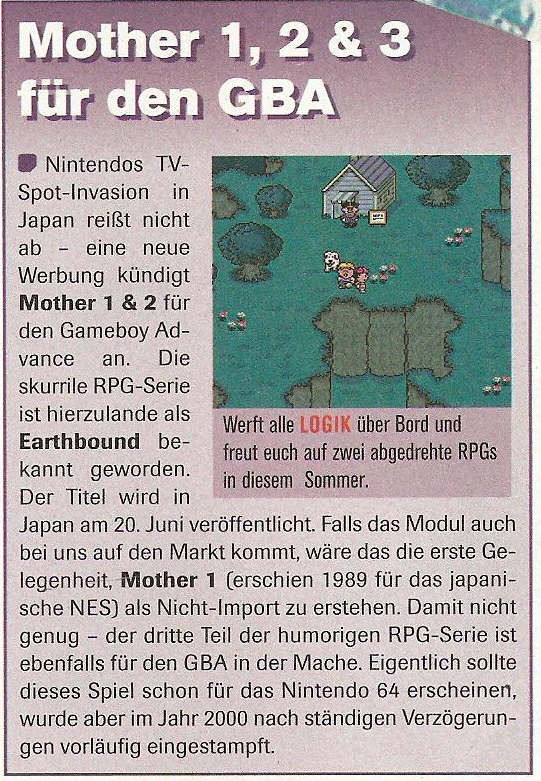 In case the cartridge also comes to our market, it would be the first opportunity to purchase Mother 1 (appeared in 1989 for the Japanese NES) as a non-import. If that isn’t enough – the third part of the humorous RPG series is also in the works for GBA. Actually this game was supposed to already appear on the Nintendo 64, but in the year 2000 after continuing delays it was canceled. Throw all LOGIC overboard and rejoice for two wacky RPGs this summer. Nintendos TV-Spot-Invasion in Japan doesn’t stop – a new commercial announces Mother 1 & 2 for the Gameboy Advance. The quirky RPG-Series is known to us as Earthbound. The game will be released in japan on the 20th of june. If the game will be released to us, it would give us the first chance to play Mother 1 (released 1989 for the famicom) as a non-import version. Thats not all – the third game of this humorous RPG series is in the making for the GBA. Actually, the game was planned to be released on the N64, but was canceled in 2000 after numerous delays. haha, I was way to slow 😀 yours is much better. Looks fake to me, sorry. Adelina probably thinks this is a recent article, instead of one released in 2003. Man, almost ten years already? A lot has happened in ten years, Mother 3 translation, Mother 1+2 translation, fan games, and much much more. That article is not fake. There is no actual announcement that the games would be released in Germany. Why would they say it is known in Germany as EarthBound? It is known as nothing in Germany, because it was never released in the PAL region. Did you hear that? It’s coming out soon! Now all I have to do is sit here and wait………..